INDICIUM Capture | INDICIUM Software, Inc.
An effective capture system is a critical first step towards a successful content management solution. If the information is not accurately captured and properly stored & indexed in the system, the application cannot operate effectively. The INDICIUM Capture Series effectively tackles the problems of data capture and document capture, by automating the processes needed to capture, index, and import paper/electronic documents into any content management system (including SharePoint), regardless of manufacturer. The Series is widely used by clients because of the tight integration with their content management and workflow infrastructures, and the high granularity of automated indexing. As a fourth generation product, the INDICIUM Capture Series is easy to use and includes deployment options to facilitate enterprise backup and recovery operations, as well as SQL-based configuration tools accessed via browsers to support the administration of globally-deployed modules from a central site. The modules take their settings from a central SQL table, running as services where possible, or as application nodes in global networks. They act as import gateways to the content management infrastructure and integrate with workflow processes which consume, generate, and re-version documents. INDICIUM Capture – Highly intuitive capture solution for paper documents, providing full scanner control, image enhancement, and automated indexing through cross-referencing legacy systems to reduce time and labor costs. 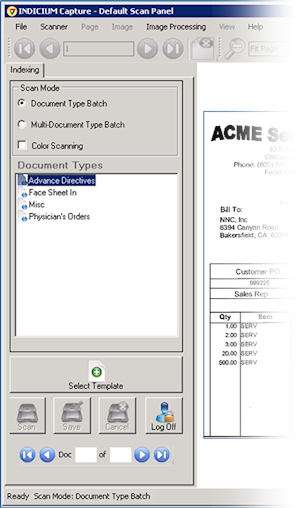 Features include batch scanning, barcode recognition, optical character recognition (OCR), and SQL database interfaces to load/validate index data. 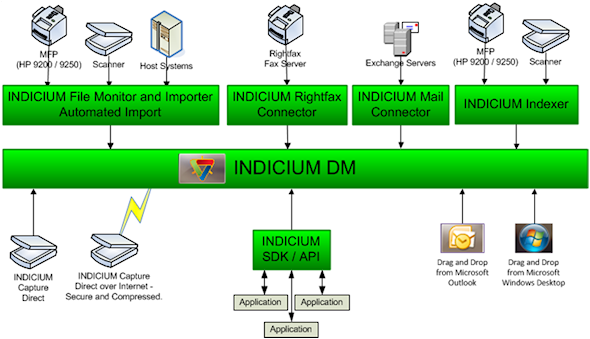 INDICIUM Parser – Flexible capture and indexing tool which accepts report spools from host systems; separates individual documents from the spool; extracts indices; reformats documents or spools, and moves the indices and documents on to the INDICIUM Gateway for import to the target content management system and for automated workflow initiation. Additionally, it handles e-mail messages, incoming electronic faxes, and desktop documents such as word processing, spreadsheet, drawing and presentation files. INDICIUM Parser eliminates human involvement in the capture and indexing process, except for monitoring and control. INDICIUM Indexer – This stand-alone module operates anywhere in the network to enable local or remote users to load the index data describing a scanned document. Indices are associated with the document and placed into a queue for automatic importing by the INDICIUM Gateway module. Deploying indexing to other computers enables the process to separate from Capture, allowing higher volume scanning to proceed uninterrupted by indexing. INDICIUM Indexer supports SQL, ERP and legacy file lookups for loading and/or validating indices. INDICIUM Gateway – This module monitors designated queues and imports electronic documents, files, and metadata into content management systems. It can import any kind of object, including Word documents, spreadsheets, AutoCAD drawings or other objects (e.g., a zipped file) placed in the INDICIUM Gateway queue. Solutions are customized to provide highly granular legacy system integration. INDICIUM Viewer – With the simple press of a hot-key, the INDICIUM Viewer is launched using the index information extracted from your legacy application. The Viewer can be invoked from any host application and can access document images, electronic files, and reports from multiple disparate systems. It can also be configured to launch a full listing of available files for a particular client, account or patient. INDICIUM Archive – This module compresses original input and permanently stores the compressed files, enabling clients to meet audit recovery and regulatory requirements which demand the original input. INDICIUM Archive can operate on input queues residing anywhere in the global network, including at an off-site storage vendor location. INDICIUM PDF – This module accepts input files of any format and produces Adobe PDF and/or PDF plus Text formatted files. INDICIUM PDF deploys a programmatic tool called up by INDICIUM Parser and INDICIUM Gateway, depending on customer requirements for reformatting original input for storage. It is also deployed to reformat files retrieved from content management systems before the documents are sent to the user.